Today was a day for celebration and not because it is the first day of Winter. No, after 10 long months Karla has finally finished the battle against her cancer with the last radiation treatment this afternoon. She celebrated this evening with a run. I look forward to her quick recovery and hope we can do some training together soon. We plan to run the Myrtle Beach Marathon together in February 07. 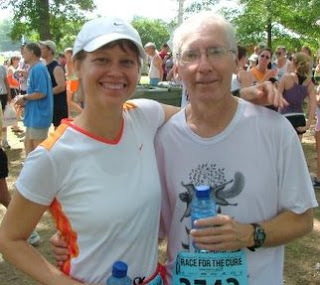 The photo was taken in the summer of 2005 at the Race for the Cure during our training together while preparing me for my Boston qualifying attempt. On this happy day neither of us would know how different things would be at this same event in 2006. Thanks to everyone that supported Karla and her family during this difficult time with your thoughts and prayers.